Subcell resolution has been used in the Finite Volume Method (FVM) to obtain accurate approximations of discontinuities in the physical space. Stochastic methods are usually based on local adaptivity for resolving discontinuities in the stochastic dimensions. However, the adaptive refinement in the probability space is ineffective in the non-intrusive uncertainty quantification framework, if the stochastic discontinuity is caused by a discontinuity in the physical space with a random location. The dependence of the discontinuity location in the probability space on the spatial coordinates then results in a staircase approximation of the statistics, which leads to first-order error convergence and an underprediction of the maximum standard deviation. 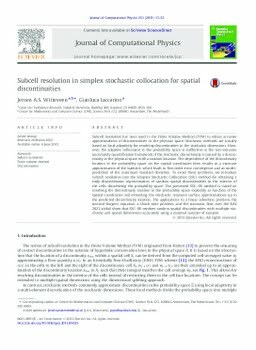 To avoid these problems, we introduce subcell resolution into the Simplex Stochastic Collocation (SSC) method for obtaining a truly discontinuous representation of random spatial discontinuities in the interior of the cells discretizing the probability space. The presented SSC–SR method is based on resolving the discontinuity location in the probability space explicitly as function of the spatial coordinates and extending the stochastic response surface approximations up to the predicted discontinuity location. The applications to a linear advection problem, the inviscid Burgers’ equation, a shock tube problem, and the transonic flow over the RAE 2822 airfoil show that SSC–SR resolves random spatial discontinuities with multiple stochastic and spatial dimensions accurately using a minimal number of samples.